Hier finden Sie eine allgemeine Einfuehrung in die Grundlagen der Cherenkov Strahlung und ihre Nutzung in RICH Detektoren. Figure 1: Detector layout of RICH, positioned behind a large aperture dipole magnet with a silicon tracking system inside. The RICH will be followed by several transition radistion detectors serving for further electron identification and tracking. Combined with particle identification information from the other detectors, a pion suppression of 10000 is required out of which a factor 100-1000 has to be provided by the RICH alone. High detection efficiency of electrons is also required which calls for 10-15 hits per electron ring at minimum. As global tracking has to connect tracks in the STS and TRD, therefore the RICH detector should not extend 3 m and and a material budget of 3-4 % radiation length in order to reduce multiple scattering. A large acceptance of 25° in the laboratory has to be covered to identify the vector mesons in a wide range of rapidity and transverse momentum. As introduced above, the Ring Imaging Cherenkov detector (RICH) is designed to provide electron identification in the momentum range of electrons from low-mass vector-meson decays, i.e. from lowest momenta up to 10-12 GeV/c. These requirements define possible gaseous radiators for the RICH detector; in addition it would be preferable if the gas is easy to handle, chemically passive and inflammable: Assuming that pions can be separated from electrons up to 90% of the maximum Cherenkov opening angle ( ), the momentum range for identification is illustrated in the figure below in dependence on the Lorentz factor , where n is the refractive index of the medium. A radiator with would be ideal, because then the Cherenkov angle of pions is less than 90% of for all momenta smaller than 12 GeV/c. 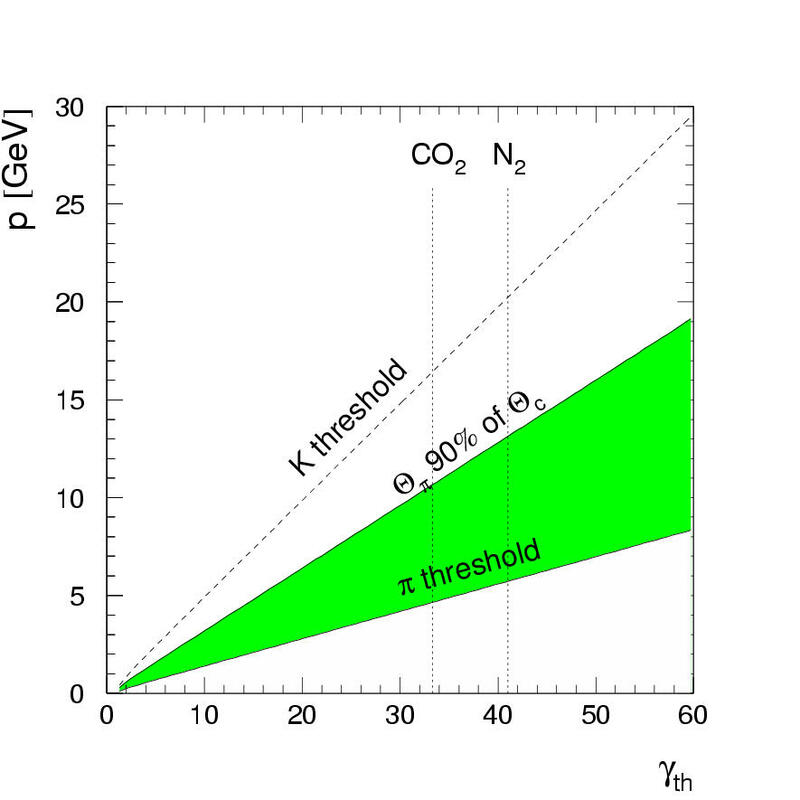 Figure 2: Momentum threshold for Cherenkov light production for pions and kaons in dependence on . Also shown is the momentum at which the opening angle of pions corresponds to 90% of the opening angle of electrons. The green band thus indicates the approximate region of pion identification in dependence on . for CO and N is indicated by the dashed lines. Nitrogen would fulfill all requirements, but also CO can be of interest. Important characteristics are its chromatic dispersion and transmittance, see figures below. One concern of nitrogen might be its fluorescence which could be quenched by some addition of CO [H. Morii et al., Nucl. Instr. and Meth. A 526 (2004) 399]. As PMTs are foreseen as photodetector, a lower wavelength cutoff of 175-150nm is fine. Within this range also the ring resolution does not yet suffer from the chromatic dispersion. The most important consideration concerning the mirror material will come from global tracking simulations: STS and TRD tracks have to be connected with high precision which limits length and material budget of the RICH detector. The maximum length will determine the radius of curvature. And as the mirror gives the largest contribution to the material budget of the RICH, the maxium allowable radiation length will determine whether glass mirrors can be used or a lightweight material such as carbon has to be used. Currently, we aim at glass mirrors of 3-4mm thickness and a diameter of 50-60cm. Mirrors based on carbon fibres are kept als alternative. The coating should provide highest reflection for the full range of photons not absorbed in the gas and detected by the photodetector, i.e. down to about 150nm. The choice will thus be a Al+MgF coating. Photodetector: different options available, i.e. However, these dimensions and the overall layout are not yet optimized. Main aim of the simulations is currently to prove that the physics can in principle be done with the proposed setup. This is a very valid concern as the proposed CBM setup is different from the "classical" dielectron experiment as e.g. CERES or HADES: In those experiments the electron identification is performed in front of the magnetic field and the main material budget introduced by tracking detectors. The CBM setup is in this respect vice versa. This bears the problem that background rejection has to be performed to a large extend with precise tracking alone, see PublicPhysics for more information on feasibility studies of the dielectron measurement. Simulations are usually performed using either single electrons or Au+Au events generated by the UrQMD model which are transported by GEANT3 through the CBM setup. In the table below typical numbers of rings/event for different energies or radiators are given. Besides these two factors the amount depends strongly on the material budget in the STS which for this simulation was 3.4mm of silicon equivalent. Tracks with equal or more than 4 hits are considered as well reconstructable. The values for the geometrical coverage include some spacings for assembly. The number of channels is calculated for the currently assumed area, an optimized layout will probably reduce the number by about 25-40%. This are a couple of independent errors of ~1 mrad size. The combined error for a full ring of N photons can be calculated as: mrad = mrad = 0.36 ... 0.7 mrad. The Cherenkov opening angle for electrons in a N2 radiator is =24.4 mrad. The estimated resolution lies thus in a range of 2...3%. For the calculation of the pion-suppression all particles were identified as electrons which fall into a radius range of in the above plot. Up to 10 GeV/c the main source of misidentification is matching of primary vertex pions to rings from secondary electrons which themselves have no reconstructed track. From 10 GeV/c on pions start to contribute in the sample which are identified as electron because their ring radius falls into the electron cut. Both sources can be reduced by additionally using in particular information from the TRD detector.